+ How durable are your carts? Unlike all other manufacturers, our carts start with an internal steel frame structure, which is then gel-coated with a rust inhibitor. 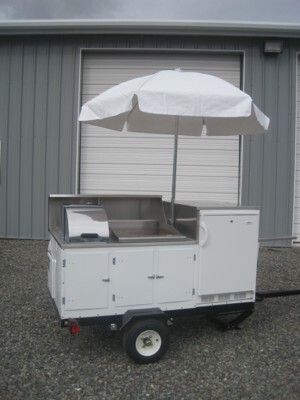 A WCCC cart is the most durable cart on the market today and made to last a lifetime. + How long will it take to get my cart once I place my order? Average build time is 7 to 14 days from date of order/deposit. Standard model carts can be ready for pick-up in as little as 3 days. Build time will vary depending on the availability of special order parts and extent of custom design. Yes. Simply call or email us any time and supply your zip code to request a shipping quote. + What is the carts power source? 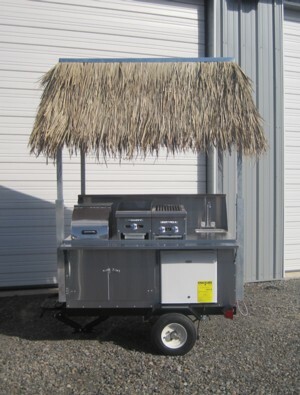 All standard cooking equipment is powered by LP gas, although carts can be built with all electric features as well. Refrigerators are electric powered and require a generator or on-site power. Water pumps and stereos are powered by deep cycle batteries. + What method of payment do you accept? We accept checks, money orders, cashier's checks, and cash. + How do I get a copy of schematics for my health department to review before I place my order? Please contact us via phone or email to request a set of schematics. We are happy to send them directly to your health department and then follow-up to discuss any questions they may have. + What type of products do you offer? Class I, II, III, & IV mobile food vending carts and concession trailers. + What options/features can I add? + Can I pick my features and design my own cart? Yes, absolutely. We are a custom shop who strives to meet our customer's needs. You can pick the size, features, layout, etc, that works best for your vending business. + Is a custom cart more expensive? Price depends on the size of the cart or trailer, and the added features. Custom does not mean expensive, it means what is right for your business. 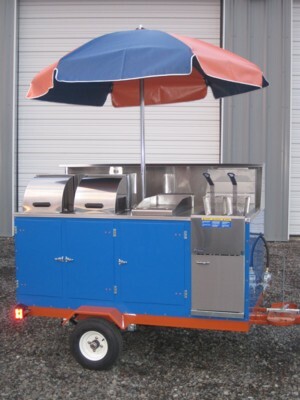 We work with all budgets to build you the best cart for your money. + Can I have my cart built on a towable trailer? Yes. Most carts are offered on a towable trailer. However, before deciding it's a good idea to check with your county Health Department and/or City or State Parks and Recreation Department, to make sure you can operate a trailer-style cart at your desired location. Some counties and cities do not allow the trailer-style on sidewalks and streets. Keep in mind, if your location does not allow for a trailer-style we can build your cart on caster wheels to meet licensing requirements. 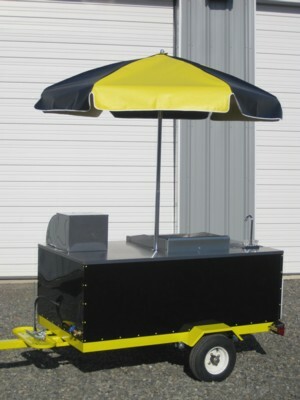 + How do I get started with a mobile vending cart business? The best place to start is with your county Health Department. They can provide the information needed to get your business plan figured out and put into action. If you have any questions during the process we are here to help! Just send give us a call, or send an email, with any questions you may have and we will do our best to get you the information you need. 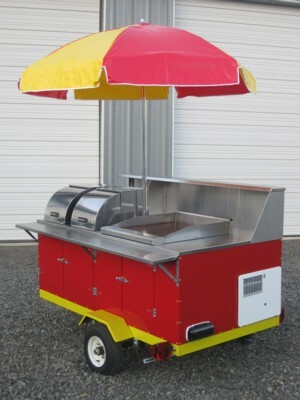 Once you know the licensing requirements you can get to the fun part, designing your cart! + Do you have a catalogue? In an effort to be eco-friendly have chosen not to print catalogues, but rather use the internet and provide as much information as possible on our website. If you would like additional pictures, information, etc, that you do not find on our website please contact us and we will be happy to supply the information you are looking for.